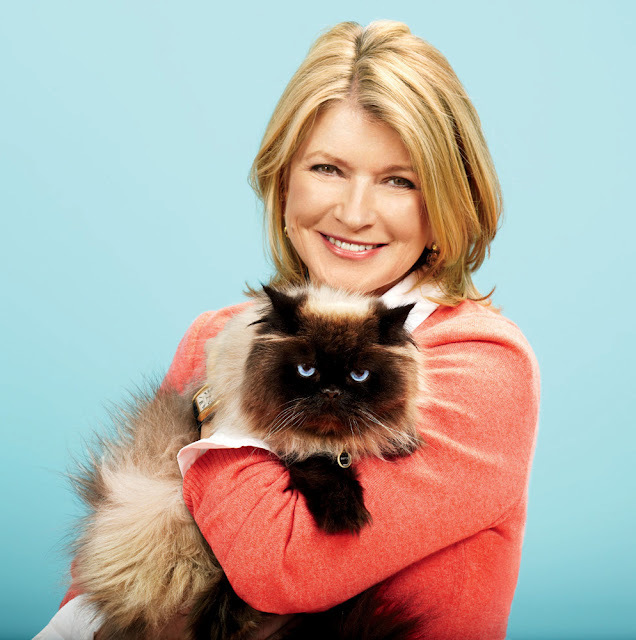 MARTHA MOMENTS: It's Cat Week! 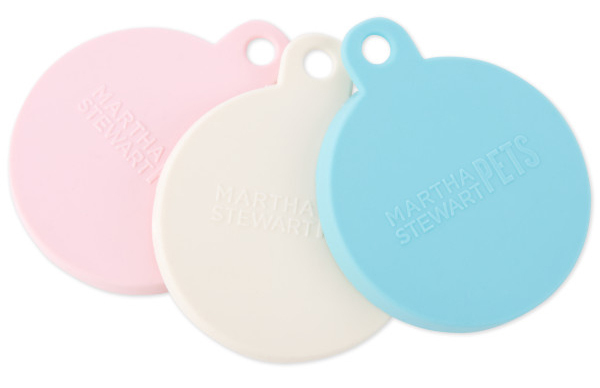 Martha Stewart and PetSmart recently teamed up to develop a new line of products for cats, adding to the wide selection of Martha Stewart pet supplies already available at PetSmart. To celebrate the launch, I'm dedicating a week's worth of posts to the mystery and wonder of cats - and a very exciting giveaway that will see one reader receiving one of the new cat products from PetSmart! Stay tuned for details on that soon! Among the new additions to the PetSmart line are cat-friendly feeding bowls and mats, a well-designed bed and an array of cat toys, all made exclusively for Pet Smart stores and PetSmart.com. Martha, who has five cats, tested the products with her pets at home and is very pleased with their quality, practicality and style. Here is a list of the new cat products. Click here to learn more. -- 3-Piece Bowl Set or Double Feeder: Cat-sized feeding bowls are made of non-skid melamine with separate stainless-steel bowl inserts. Designed with shallow wells for a cat's sensitive whiskers, these durable, lightweight bowls also make clean-up easy. An air-seal lid helps keep food fresh, and the convenient hand grip means fewer spills. -- Feeding Mat: This generously sized silicone mat catches food, while a lipped edge prevents wet, messy spillovers. -- Can Cover: Any can of uneaten food can be easily resealed for refrigeration with this universal can cover. Each silicone lid fits three different can sizes, so the cat food will stay fresh until the next feeding. -- Food Scoop: This food scoop, made of enamel-on-stainless-steel, makes portion control simple when measuring dry cat food. -- Food Jar: This airtight container keeps dry cat food fresh and is pretty enough for the countertop. 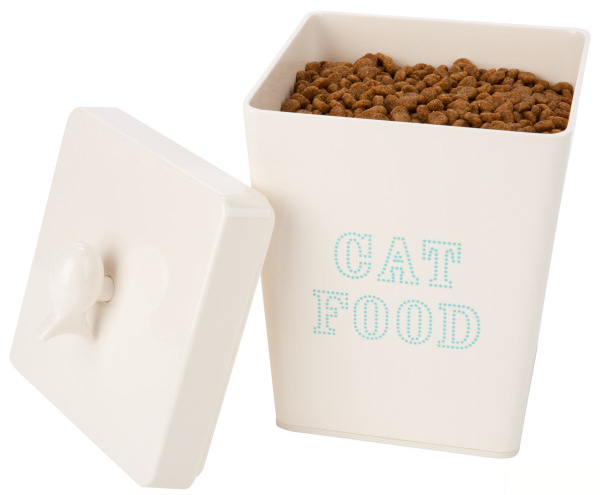 Made of smooth, sleek ivory melamine with 'Cat Food' lettering in blue. The 2-in-1 bed features fish-patterned, burnout fleece and is fully machine washable. This cozy, innovative bed comes in gray or brown and will be available in October. -- 2-in-1 Bed: Pops up to create a hooded space for sleeping and playing out of view and collapses into a classic bolster shape. Ten unique toys ensure fun and safe playtime for cats. 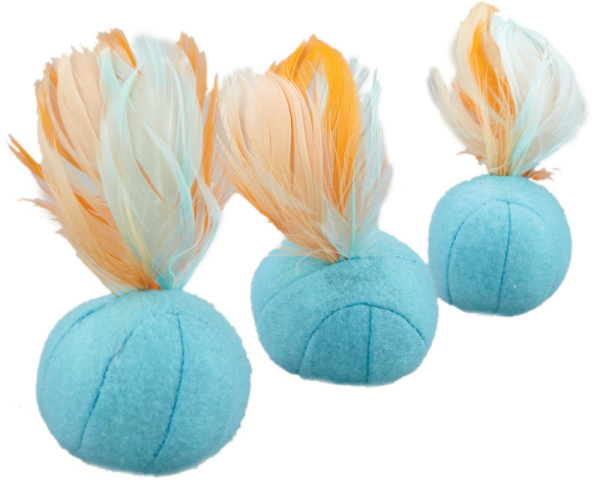 Arriving in September, the cat toys are expressly designed to address different types of play and include independent toys to encourage play and exercise and interactive toys to provide bonding time for the cat and pet parent. -- Dangle Toys: Dangling designs are great for independent or interactive play. These catnip-filled toys stimulate a cat's natural curiosity with their varied textures, animal faces and exciting smells. -- Jingle Toys: These catnip-filled toys with jingling bells are great for independent or interactive play. Jingle toys are available in a variety of animal faces. -- Knitted Toys: A toothsome crochet-knit construction makes these toys great for independent or interactive play. Knit toys are catnip-filled and come in a variety of textures and animal faces to arouse the cat's natural instincts. -- Teasers: Teasers provide all-day entertainment with bright colors and soft materials that will keep the cat engaged and curious. For long-lasting independent play, a teaser or "fuzzy" can be sprayed with catnip oil. It's nice so see she's hasn't forgotten the cats.